Five years after he went missing, an event still shrouded in mystery, a seminar was held in Beirut dedicated to the Jesuit missionary in Syria who challenged the country’s regime and tried to deal with jihadis. His parents “call for every effort to be made to know his fate”. Beirut (AsiaNews) – A seminar was recently held in Beirut dedicated to Fr Paolo Dall'Oglio to highlight the testimony he leaves to Christians and Muslims. The Syria-based Italian Jesuit went missing more than five years. The conference focused on his work laying the foundations for a "path of hope" through Christian-Muslim dialogue. For him self-sacrifice was an "extreme act of love" as he tried to free prisoners held by the Islamic State group. What follows is the edited report on the seminar by the deputy editor-in-chief of L'Orient-Le Jour. 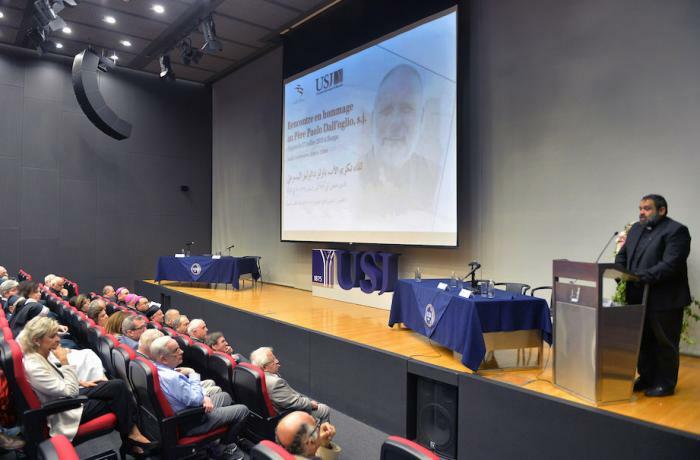 A ceremony in honour of Jesuit priest Paolo Dall'Oglio was recently held at Saint Joseph University (USJ) in Beirut. A fascinating figure in the Christian-Muslim dialogue, Fr Dall'Oglio went missing in Syria on 29 July 2013 when he entered the headquarters of the Islamic State in Raqqa to defend the cause and demand the release of several hostages held by the jihadi group. The ceremony was however centred less on the enigma of his disappearance than on the mystery of the gulf between the Christian and Muslim religions, which he tried to cross. To bridge this gulf, Jesuit Provincial Father compared Paolo Dall'Oglio’s spiritual adventure to that of Abraham, seens as "God’s friend" in the Holy Scriptures. [For] P. Younès [. . .] Faith is not doctrine. Faith saves, doctrine teaches. [. . .] It is in friendship, which God alone can give, that Paolo found his vocation. From that he saw the vocation of the Society of Jesus, of all religious families even. The provocative syncretism in his thought is not at the level of doctrine, but at the level of friendship. This is certainly not a comfortable place since it must live in controversy." Can we, from this starting point, establish a theology of interfaith encounter? For the rector of the USJ, Father Salim Daccashe, "the great question for Paolo Dall'Oglio, the one he never stopped asking, was: What does Islam tell Christians? By the same token: Towards what does Christianity lead? Following Charles de Foucauld and Louis Massignon, his two great spiritual masters, Paolo thought that the Muslim religion, by the mystery it posed for Christians, pushed the Church towards greater radicalism in the imitation of Christ, towards more humility, spirit of acceptance and service." "Dear Friends," Father Daccashe added, "I am tempted to say that Paolo's strength and his relevance today is that he leaves us with questions [. . .]. Faced with these questions, Paolo's long-term view was to lay the groundwork for the path he called the path of hope." Paolo Dall'Oglio was, so to speak, a man in danger, and for him, spiritual and physical dangers were all the same. He first met danger by settling in Syria. Then, after he was expelled, he took the risk of going back there illegally. Hostile to dictatorship, he had indeed freed the word of those who opposed it. He used to say that "Many Syrians have told me that when you manage to overcome fear and open yourself to others, you go from being a slave to being a citizen. When you doubt that the president is a god, which you have been taught since kindergarten; when you manage to separate the truth from authority, to distinguish objectivity from power; and when, in the street, you claim your dignity; then you can feel a moment of truth, freedom and authenticity. The most incredible thing is that they arrest you for that and torture you, but the next day you go down to the street. Because they cannot hit you in the heart of your newfound dignity, that of a free man. Even if they hit you, torture cannot undermine this newfound dignity." His third great physical as well spiritual danger was his approach to the Islamic State, an approach in which faith in the possibility of dialogue was central, despite all the reports about the organisation’s savagery. "My impression, as a 'cautious person', of Paolo Dall'Oglio's decision to go inside the lion's den (...) is that it may have been a reckless, risky adventure, especially for someone alone," said Khaled Akasheh, head of the Islam Bureau at the Pontifical Council for Interreligious Dialogue. "Let me tell you about Father Jacques Mourad’s testimony, a member of his community, whom I met last month in Bologna, Italy. With respect to this decision, Father Murad told me that Father Dall'Oglio was very aware of the risk he was taking, but that he felt in his heart a call to go to Raqqa, to try to liberate some detainees. It was not a decision taken on a whim, but an act of extreme love." [. . .] Under the impetus of Pope Francis, the Church has become "a global galaxy; much less an institution and much more an engine of evangelisation," said Giorgio Benvenuto, president of the Bruno Buozzi Foundation. Based on this model, he added, dialogue has become "an important forerunner of a value that is ever more lacking nowadays: solidarity."